This program has expired. No credit can be earned. An opportunity to fully engage in education as it applies to your own practice. Performance improvement continuing education activities have the goal of moving beyond acquisition of knowledge to application of knowledge in professional practice. By taking learning a new fact or procedure to the level of actually putting it into practice, it is moving from simply “knowing” to “knowing how” and actually “doing”. But it is more than this. It is thinking about and developing measures to assess the outcomes of the changes in clinical practice made as a result of a continuing education activity, implementing the change in practice, and evaluating the outcome. This activity is intended for participants of the live meeting or on demand replay of the satellite symposia "The Evolution of Antibiotic Therapy for the Treatment of Gram Negative Infections" to meet the needs of infectious disease specialists, critical care/pulmonologists, surgeons, pharmacists, nurses and other members of the health care practitioner team who have an interest in the management of Gram-negative infections. Reflect upon the learning experience and how it relates to their day-to-day professional practice. Identify a change or changes you contemplate could be made in your day-to-day professional practice as result of something learned in this learning activity that could improve patient care outcomes. Describe how the change(s) in the care of a patient could be implemented and assessed. Summarize and evaluate the results of the change or changes in the care of a patient. 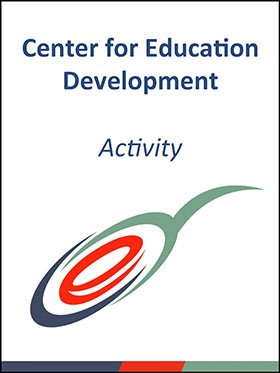 Center for Education Development designates this live educational activity for a maximum of 2.0 AMA PRA Category 1 Credit™, 2.0 CPE credit (UAN # 0498-0000-16-011-H01-P) or 2.0 ANCC credit. Participants should claim credit commensurate with the extent of their participation in the activity. Participants must participate in the session and complete an activity evaluation before October 28, 2017. Pharmacists are required to pass the post-test with a minimum score of 70%. Faculty and staff disclosures, as applicable, for the pre-requisite to this learning activity were provided in the attendee hand out or online activity web page. Created and published by Center for Education Development. Printed in the USA. Copyright © 2016 Center for Education Development. All rights reserved. No part of this publication may be reproduced without written permission from the publisher. The material presented at or in any of Center for Education Development continuing medical education activities does not necessarily reflect the views and opinions of Center for Education Development. Neither Center for Education Development nor the faculty endorse or recommend any techniques, commercial products, or manufacturers. The faculty/authors may discuss the use of materials and/or products that have not yet been approved by the US Food and Drug Administration. All readers and continuing education participants should verify all information before treating patients or utilizing any product. Please complete the following questionnaire before continuing. 2. Reflect on the CE activity experience. Evaluate and list how the knowledge gained applies to your daily practice and to your patients. 3. Identify and Plan to implement one or more changes in practices. Include a sufficient description of that change. Describe the change you have selected for application in your practice towards performance improvement. 4. Describe the measures that can be used to assess the outcome or results of the change. There may be more than one outcome measure used. What specific measurements can be used to evaluate the impact on practice improvements? How will the impact be measured? 5. Application of change in practice. Describe how the planned changes were applied in practice. 6. Evaluation and Reporting of change and determination of practice improvement. To claim credit for participation in this activity, please click “Submit Form.” Your activity will be submitted for faculty review. Pursuant to faculty review, physicians and nurses will be e-mailed a certificate of completion and pharmacists, once all credit criteria have been met (see accreditation statements), proof of participation will be forwarded to ACPE/NABP.